After six months of hibernation, Koopa was more than a little bit groggy. This has been a roller coaster of an emotional year for me. My girlfriend and her child moved in during the summer, and it's been great having a family of my own. 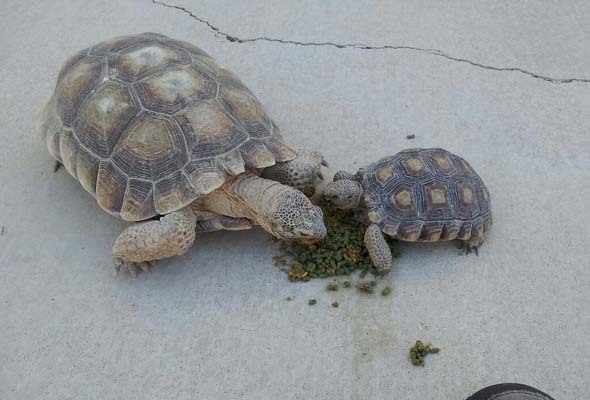 But sadly, shortly after my new family came together, we lost a member of that family.My beloved little baby tortoise Koopa died in a tragic accident back in August. It's taken me a while to work up the courage to write about it, and it still haunts and saddens me to this day. Koopa came out of hibernation in spring and seemed to be happy and healthy. The year started out well for myself and Koopa. She came out of hibernation a little early and seemed happy and healthy. She had a full appetite and was very active after her 6-month slumber, which is always a good sign. However, in April I started noticing an odd black residue lining her mouth. I feared that this might be a symptom of something like mouth rot, and so after waiting a couple days to see if it cleared up on its own, I took her to a local veterinarian. 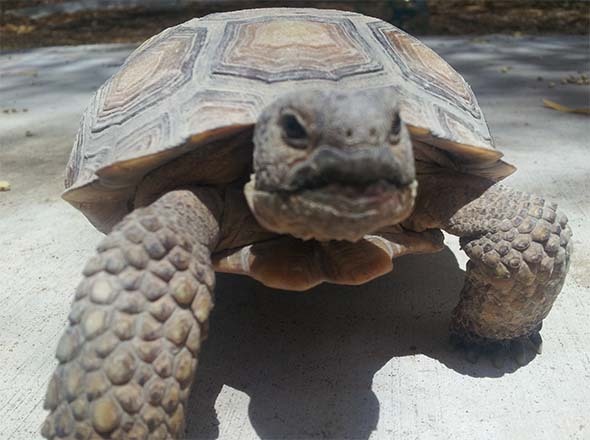 The vet suspected that the problem was likely a bacterial respiratory infection, which is a common condition for tortoises. If left untreated, it can develop into more serious illnesses such as pneumonia, which can be fatal. But it's fairly easy to treat if caught early, so the vet started Koopa on a regimen of antibiotics. She also took a blood sample and cultures from the mouth to try to identify the specific contagion. We started with a series of antibiotic shots administered every three days for a few weeks. Koopa did not like those at all! I would place her in an old Amazon cardboard box in order to take her to the vet, and it was clear that she did not like being placed in those boxes. The shots also seemed to hurt or cause slight discomfort, as I would sometimes see her stretch or roll her leg after getting the shot. It was a motion similar to how a person might rotate your arm around to stretch out a sore shoulder. But since it was her front leg, it often resulted in her faceplanting into the ground. It was a little cute and funny, and I wish I had video of it. but if it persists and darkens, then it is indicative of a respiratory infection. The vet also recommended that I keep Koopa indoors until the variable spring weather passed and the consistent heat of summer showed up. She wanted a stable temperature and environment for Koopa in order to help manage the infection. 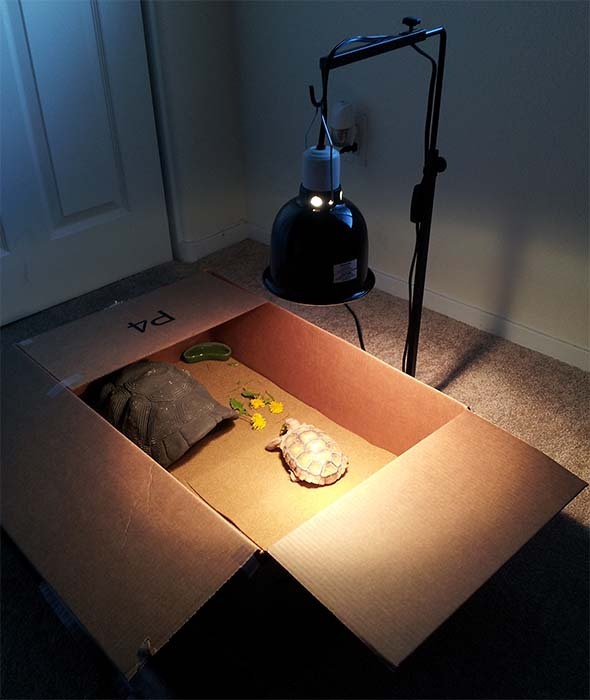 I didn't have a terrarium or anything, so I had to keep Koopa in a large cardboard box with a heat lamp mounted over it. Koopa didn't like the box very much, so I'd let her out in the back yard whenever it was warm enough. The black residue eventually started clearing up, and Koopa seemed to be doing very well. She kept a healthy appetite all throughout the treatment. In fact, she ate way more than I had ever seen her eat. She grew considerably over the course of the summer, increasing her weight by a whole third. But the culture returned positive for a particularly nasty reptillian infection called mycoplasma. This forced us to also have to give her a regimen of a liquid antibiotic over the course of several months. I'd have to mix the antibiotic into her food every few days. This was easy enough, as I'd usually just use the syringe to spread the medicine over a dandelion flower. Dandelions were her favorite food, and she would gobble the medicated flowers up in no time, leaving virtually no trace! Again, she did not show any worrisome symptoms, and it seemed that we had the illness well under control. It was a huge relief, as I was very worried when she first became sick. 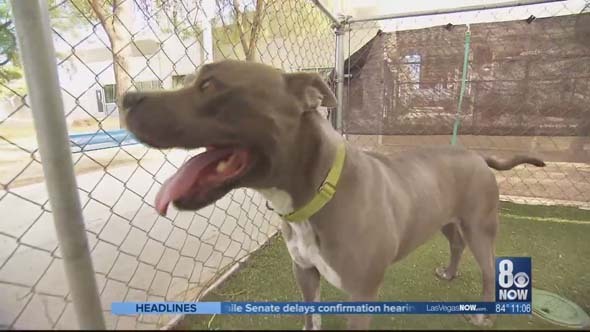 The vets did an excellent job of taking care of her, and it seemed that she was going to make a full recovery. 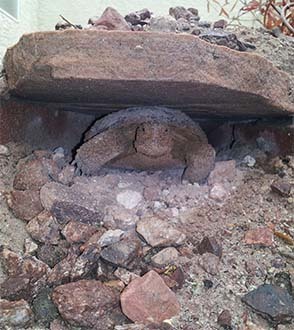 We expected that the worst case scenario was that she would remain a carrier for the disease, and could relapse or spread it to other tortoises. 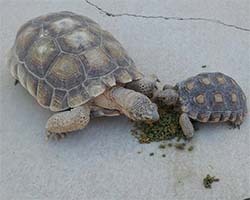 But it would be easy enough to control, and she didn't live with any other tortoises, so there was no risk of infection. 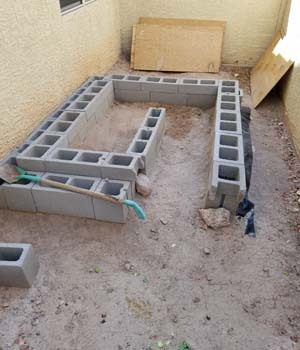 We had to keep Koopa inside during the spring in order to maintain a stable temperature and environment. Just to be safe, I resolved to hibernate Koopa indoors this winter. I wanted to keep her out of the elements so that I wouldn't have to worry about a severely cold or wet winter possibly aggravating her condition and resulting in a relapse during hibernation. I had planned on buying a medium-size terrarium and lining it with a faux-dirt mat and maybe some real dirt from the backyard. I would place her little tortoise-shell shelter in the terrarium so that she would have a dark, secluded place to sleep, and I would cover the terrarium with a blanket or towels to help insulate it. I would rest easy knowing that she was not exposed to the elements, and that I could easily check on her condition whenever I would want to. 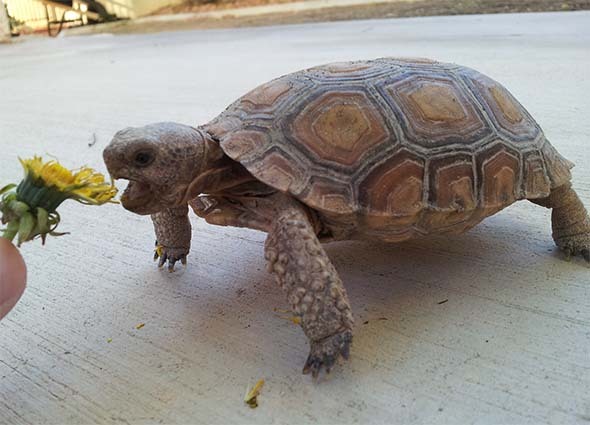 Koopa eating a dandelion back in spring of 2014. 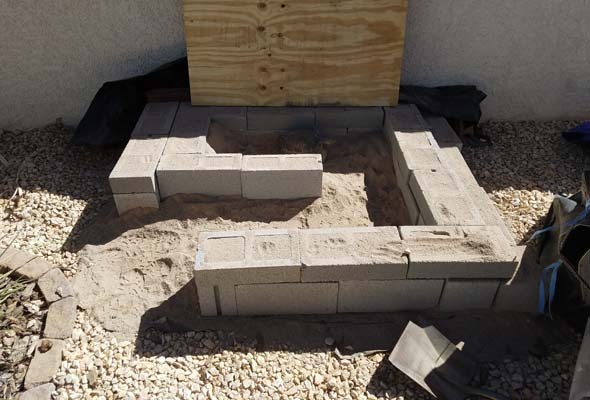 Last year, my pet tortoise, Koopa began to outgrow her second burrow, and I had to construct a larger one. It was just in time, too, because she had actually begun digging underneath a brick that had lined the back of the burrow. 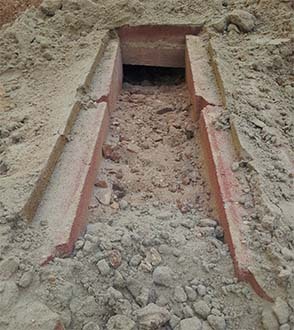 If she had dug around the dirt a little bit more, the brick could have fallen she may have gotten stuck. [LEFT]Koopa was getting a bit too big for her old burrow. [RIGHT] She also dug under the brick that lined the back of her burrow, which could have caused her to get stuck. Koopa becoming trapped in her burrow is something that I was particularly sensitive to, since earlier that year, one of the family's other pet tortoises had died. Nipper was a tortoise that my parents got when I was very young (around eight). I had grown up with her, and she had become a constant fixture in my life. Her appearance in the backyard was always the signal of the start of summer. But she somehow became trapped in the burrow after hibernating the previous winter. She tried to dig herself out, but apparently didn't quite make it, and she either suffocated or starved to death burried under the ground. 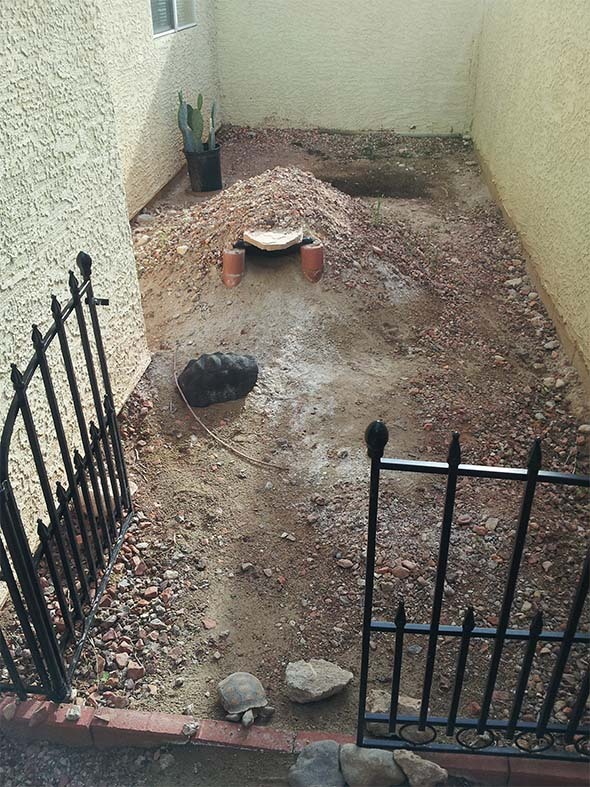 In May, after all the other tortoises had awoken from hibernation, and Nipper was still AWOL, my dad dug up the burrow to look for her, and found her lifeless corpse. It was a scene that I had lived all to many times in my nightmares growing up, as the health and safety of the tortoises was always a source of anxiety during the long months of their hibernation. Her death was particularly traumatic for me, as I was completely unprepared for such an eventuality, despite having rehearsed it so many times in nightmares. When you adopt a puppy or a kitten, you also take on the uncomfortable burden of knowing that the animal that you are going to grow and love comes with an expiration date. Cats can live for an average of 15 years; whereas, a dog is fortunate to make it past 10 or 12 (depending on the size and breed). 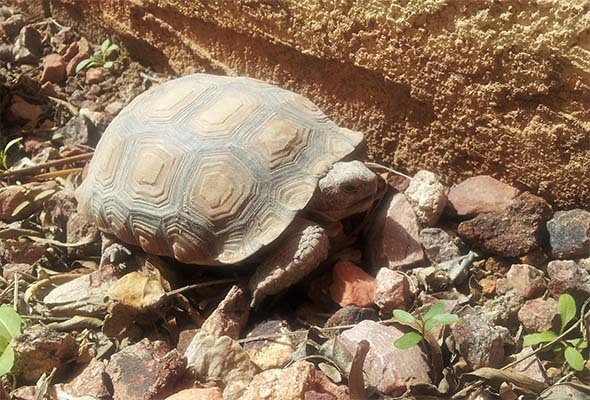 But the lifespan of the desert tortoise isn't entirely known. I've seen estimates ranging from 50 years to 150 years. But I think the general consensus is somewhere between 50 and 80. Nipper sharing a meal with her child, Bubbles. In any case, when we adopted Nipper, there was a realistic expectation that she could outlive me! Having to cope with her death was not something that I was prepared to handle because I had a realistic expectation that I would never witness it. I always figured that I'd be passing her on to my children or grandchildren. So for her to pass away due to an entirely avoidable accident after a mere 20 years was heartbreaking. She was in the prime of her life, and should have had many more decades of happily chomping on dandelions.